Hey There! If you are a Paul McCartney fan, if you're a vegan McCartney fan, or you're a vegan who is familiar with veganish hashtags, then you probably know about Meat Free Mondays. If you don't belong to any of those groups, I'm gonna explain you what it's all about. Although I really shouldn't because you really have to be punished if you don't like the Beatles! Paul (I'm a fan, I can call his first name) started this campaign, so that if you can't/don't want to omit meat from your whole life, at least you can omit it from one day of it. He himself cooks a vegan recipe each Monday and shares the pictures on his Facebook (you should totally check them out, he's got a fancy kitchen!) So…as today is also a Monday, I am here to teach you a vegan recipe! This is a traditional Persian dish. Ladies and gentlemen, let me introduce you to the dish EVERY Iranian guy loves shamelessly, and that is a favorite of many girls: Ghormeh Sabzi! And no, it's not that hard to pronounce once you know that "Ghormeh" means pot roast beef and "Sabzi" means veggies. As today we want to see what it's like to be a vegetarian, I have found you a variation of the recipe from here, but I'm gonna make some changes in it. This vegan recipe replaces meat with mushrooms. And in a weird way, it tastes the same as the one with meat! 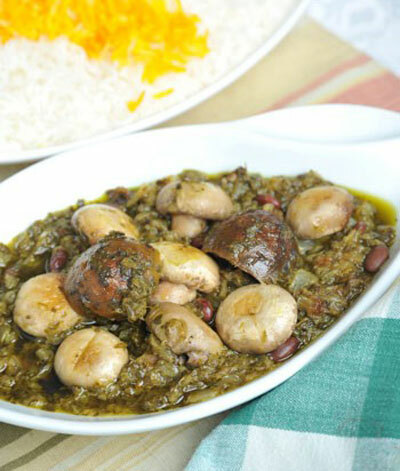 Normally, Ghormeh Sabzi is served with rice. So I've also included a little guide for that at the end. It's better if you prepare both rice and Ghormeh Sabzi at the same time, so that you can serve the whole thing hot and fresh off the stove. Let's get goin'! this recipe is for 4 people. Ingredients Cowpeas or kidney beans, 1 cup Sliced mushrooms, 1 cup An small onion, chopped Leek, parsley, coriander and a little fenugreek leaves (all in equal amounts, except fenugreek leaves should be 1/3 of leek – overall 1 kg) – Chopped 2 medium tomatoes, chopped in half 4 Sun-dried limes (available in Middle Eastern shops) Tomato paste, 2 sp Salt, pepper, turmeric and thyme Ingredients for the rice: Rice, 3 cups Oil, two spoons One potato Water Before we start our vegan recipe, I must warn you. Ghormeh Sabzi takes quite some time to be prepared. Most of that time you aren't doing anything, but you've got to wait until it gets ready. In fact, you should decide on making Ghormeh Sabzi a day before getting to eat it! That's because the beans take a long time to cook thoroughly. They should be soaked in water for a day, and they take 2-3 hours to cook. So just read the vegan recipe once BEFORE you make it. As I said, the first thing to do it to cook our beans. A trick that My mom used was to cook the beans in advance and freeze them. That way, she could prepare Ghormeh Sabzi in 2 hours, and that'd be it. You could try that too. Once your beans are ready, pour two glasses of water in a pot and put it to boil. Add beans, veggies, onions and mushrooms. Put the lid on, bring the heat to a simmer and go watch an episode of your favorite series. My mom is a working mom. That means, I have learnt the busy-scheduled recipe. But if you ask a grandmother or stay-at-home mom, she will say that you need to keep the pot on stove for the night. Yep, that’s right. The whole night. And I must tell you, those Ghormeh Sabzis are the most delicious! Not that ours isn't, but I think the longer the veggies and other stuff stay together, the better they will taste. So if you have time, give it more time. Don't open the lid too much, but make sure it has enough water that prevents it from burning. I usually give it an hour on the stove. After some time, add some tomato paste. Stir until dissolved, and get a taste. If you feel it's good, add the tomatoes and sun-dried limes. Give it another ten minutes with the lid on. Then remove the lid and check the water. It shouldn't be that watery, but not dried either. If it has too much water, remove the lid to let it evaporate. Here comes the most fun part! We finally get to add all the spices! I LOVE adding spices. It makes me feel like the witch making a potion for Ariel the mermaid. It's adventurous! Be careful with the salt though, as the tomato paste has some salt in it already. I use lots and lots of turmeric, but just a little of thyme. I also added a "steak and Kebab spice" I had at hand. You know, to give it a little "meaty" taste. When you're done with the magic spice mix, turn off the heat. Your vegan Ghormeh Sabzi is finally ready! Soak rice in salted water for at least one hour. When it starts boiling, add the rice to the pot. Do not put a lid! Wait for it for 5-15 minutes, and taste it every 5 minutes. It has to become soft, but not too soft that it can be easily crushed. When it reaches that point, remove the pot from the stove. Empty the water and rinse the rice. Add the oil to the empty pot. Add an spoon of water. Cut the potato in thin layers and cover the surface of the pot with them. You can also use a any thin bread instead of the potatoes. Pour the rice on top of the potatoes. Make a steep mountain of the rice, so that it doesn't stick to the walls when being cooked. Put a clean piece of cloth or towel on the pot. Put the lid on top of that. Gather the hanging parts of the cloth on top of the lid and make a knot. This will ensure that the steam stays inside the pot, and helps In cooking it thoroughly. Bring heat to a simmer. Wait for 30-40 minutes. Do not remove the lid during this time! When the time has passed, remove the lid. If there is steam coming out, the rice is probably ready. Taste it to know for sure if it's completely cooked. Serve each person with Ghormeh Sabzi on top. Bon apetit!